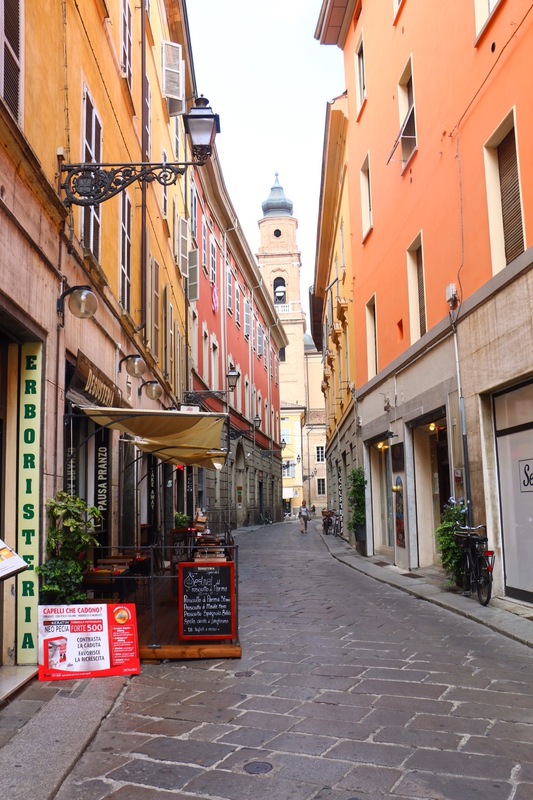 Parma is an elegant city and a must for any foodie traveller who happens to be in this area of Italy. It is maybe best known for Prosciutto di Parma and Parmigiano Reggiano cheese but it should not be discarded as a destination in its own right. Sometimes, the city is overlooked because visitors prefer to head to the neighbouring towns of Bologna, Mantova or Modena. But you should not underestimate this city and what it has to offer. It is a perfect city to visit on a day trip whether you are in Liguria or visiting the Tuscan/Emilian Apennines and is maybe less touristy than other more popular Italian cities. There is no question about the importance Prosciutto has in this region. 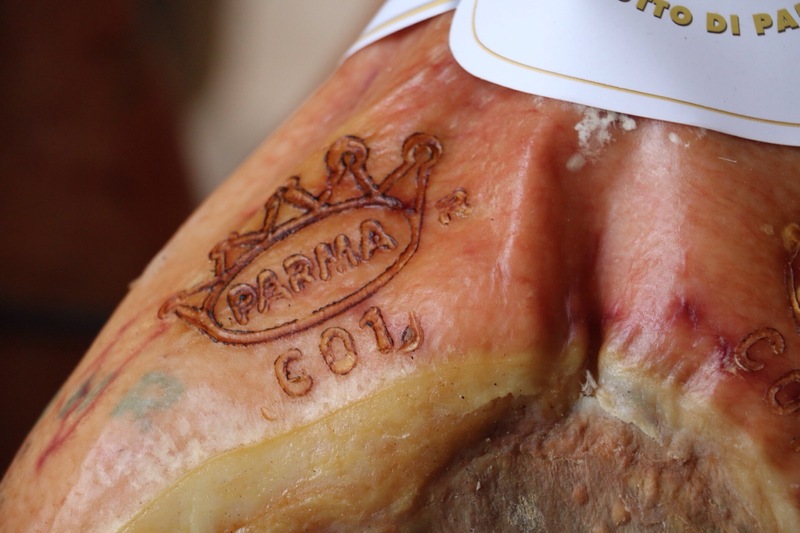 With its distinct Prosciutto di Parma mark, the city and its inhabitants are incredibly proud of this ham. When we visited, there was a festival of prosciutto and many shop windows, including a shop selling watches, made space for a poster to promote the festival. On the main square in front of the townhall, there was a temporary ‘bistro del Prosciutto di Parma’. For the festival (but not only), restaurants serve different types of prosciutto. It can vary from the type of ‘pig’ to the different ageing. 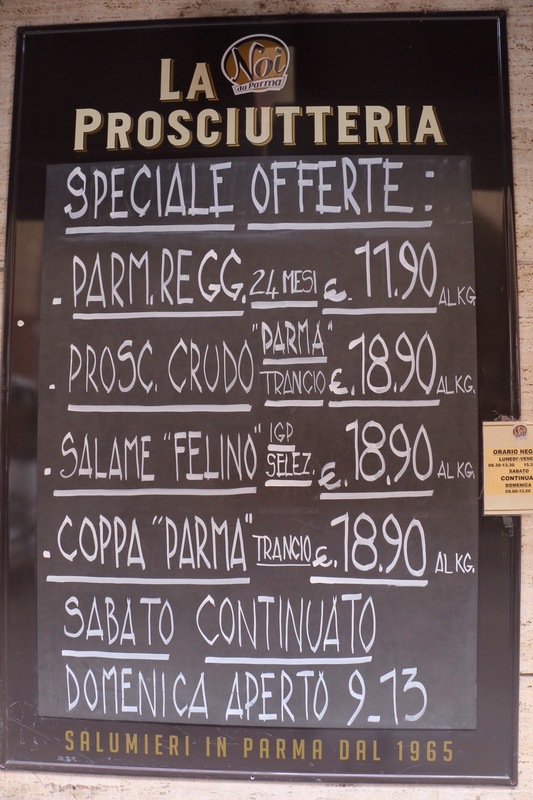 You will find, particularly in Emilia that you can get different ages of prosciutto and parmesan. Be careful, however, because once you ‘spoil’ your palate with these delicious cuts, you might not go back to the more ‘industrial’ ham that you might find at home. Needless to say, like in any other part of Italy you should start your day with a ‘caffe’ or espresso in one of the many cafes that you can find in the city centre. There is an immense choice depending on your taste in terms of decor. 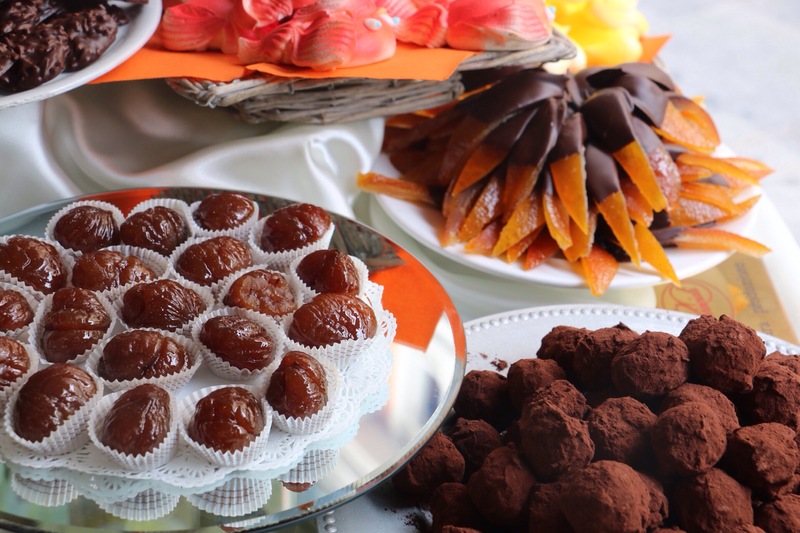 You will also be able to choose from an array of pastries as can be seen in the photo above. If you are visiting the city by car, you will not be able to enter the city centre. It is therefore best to park close to the train station and walk (it should take around 10 to 15 minutes). The centre is divided into three main parts. The main square where the town hall stands today is Piazza Garibaldi. The square leads to a pedestrianised street where you will find La Prosciutteria. When you enter this deli, you will start to ask why there is no such shop in your city. 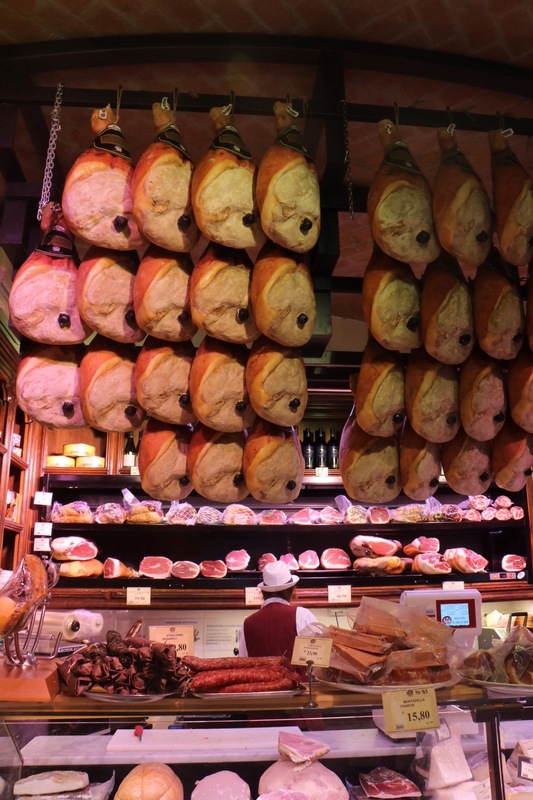 It is paradise for foodies with parmesan wheels at the back of the shop and prosciutto legs hanging from the shop’s ceiling. Here you will be able to buy the best that is on offer not only from this region but also Italy with a selection of cheeses, wines and olive oils to mention just a few things. On a nice day, you may be tempted to buy some cold cuts and go straight to one of the parks for an impromptu picnic. This is not a bad option though you will be spoiled for choice as to where to eat in the city. The second part of the city is the Piazza Duomo. 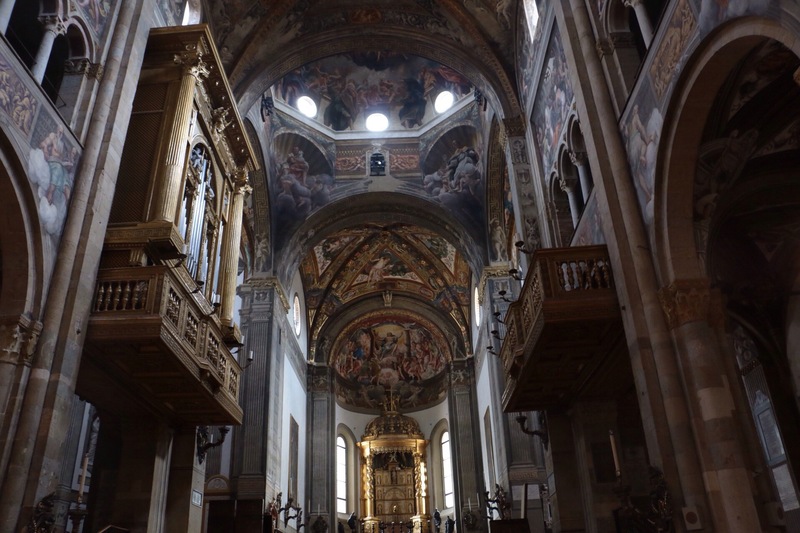 The Cathedral dedicated to the Assumption is among the main Romanic buildings of the Padana region. Work on the cathedral started in 1059 and it was consecrated in 1106. The Baptistery symbolises the passage from the Romanic to Gothic and is made with pink marble from Verona. It was finished in 1307. The bishop’s palace, also on this square, dates back to the 11th-12th century though it has been rearranged many times and the present version dates back to the beginning of the 20th century. The other main square of the city is one that you are likely to have walked past if you come by train or have parked near the station. It is the Piazza della Pilotta or the Piazzale della Pace. The Pilotta Palace belonged to the Farnese family and now houses the Archaeological museum, the beautiful Palatina library. the National gallery and the Farnese theatre. If you are spending more than one day, you may want to visit the treasures in the surrounding areas from castles and fortresses to more gourmet offerings such as a cheese museum in Soragna, a ham musuem in Langhirano or a salami museum in Felino. For lunch or dinner head to the Trattoria ai due Platani which can be found seven kilometres way from the city centre. While there are many places to eat in the city centre, we opted to visit this highly recommended restaurant and we were definitely not disappointed. It is listed in the ‘Osterie d’Italia’ guide which is published by the Italian Slow Food movement and is indeed a great discovery. The pasta is freshly made to order and was among the best that we have ever tasted. One had a salt cod filling and was served with a chickpea puree. The other was rabbit ravioli served with fennel and oven-roasted cherry tomatoes. They have a great selection of main courses. I had a vitello tonnato with veal cooked rare perfectly to order. For dessert, you can opt for a zabaglione ice-cream that is prepared on the spot and is served on a trolley. You then choose your own toppings. It’s a spectacular way to end your meal. This is a great value restaurant with exceptional cooking. Is it worthy of a detour? If like us, you love pasta, then the answer is clearly yes. What to eat: Different ages of prosciutto di parma as well as the Rolls-Royce of Italian hams the culatello di Zibello. You can also try different ages of Parmesan here. Eating fresh pasta is also a must in this region. What to drink: Do not be intimidated by the bad reputation of Lambrusco. Most of the wine that is exported from this region is industrial and not worth drinking. Here you will find the real thing and it is excellent not only as an aperitif but even to accompany the dishes of the region. Look out for the genuine Lambrusco. It should be 11% in alcohol. 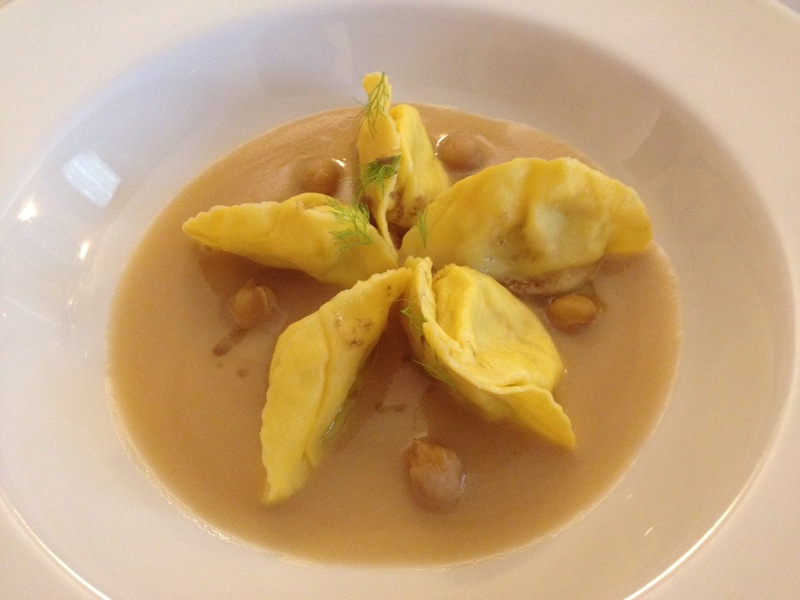 Where to eat: Trattoria ai due Platani, Via Budellungo 104a, Coloreto. (see above). When carrying out research we also came across Antichi Sapori, Strada Montanara, 315 Gaione which is highly regarded.